Complex of a clamp loader (blue), an open sliding clamp (green), and a short piece of DNA (red and orange). In our genome, it takes thousands of DNA nucleotides to encode the information for each protein, and even more to store all the regulatory information. So, when a cell needs to copy this information, it has to manage long, long stretches of DNA. As you might imagine, this is not easy in the chaotic environment of the cell. Cells use an amazing trick when they copy their DNA: they tether their molecular machines to a ring-shaped clamp, which slides along the DNA and keeps the machinery focused on its task. This leads to remarkable increases in efficiency. For instance, by tethering their DNA polymerase to a sliding clamp, bacteria increase the speed of replication from about 10 base pairs per second to up to 1000, and increase the processivity (the number of bases that are copied before the polymerase falls off and must start again) from about 10 base pairs to an average of 80,000. Sliding clamps encircle the DNA. Many form tightly-closed circles and must be forced open to allow the threading of DNA through the middle. ATP-powered "clamp loaders" perform the job of opening the clamps and placing them on DNA. 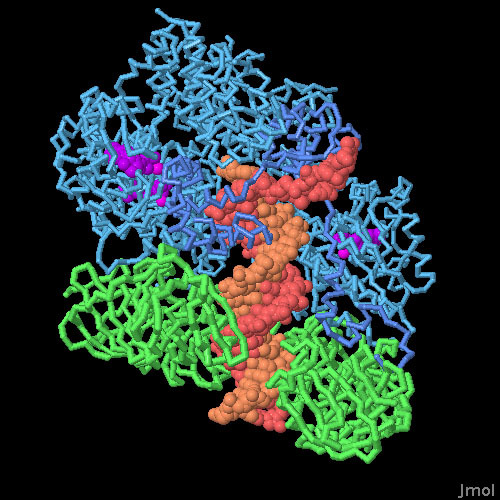 The structure shown here is from a bacteriophage (PDB entry 3u5z ), shown with the opened clamp in green, DNA in red and orange, and the clamp loader in blue. Structures have also been solved for clamp loaders from bacteria and eukaryotes--they are all similar in structure and function. They grab on to a clamp, open it up, and allow the DNA to bind inside. Much of this process is powered by the unusual helical shape of the loader, which holds the clamp in an open lock-washer shape. The ATP is used to power the very last step, to release the final clamp-DNA complex. Human flap endonuclease (blue) bound to the sliding clamp PCNA (green). Clamps ensure that DNA polymerase gets its essential job done, but they are also used for other enzymes that act on DNA. The one shown here is FEN1 (flap endonuclease 1, from PDB entry 1ul1 ), an enzyme that clips away the short RNA primers used to get DNA replication started. The structure includes the clamp, composed of three identical subunits shown here in green, and three molecules of FEN1, shown in blue. The enzymes are connected to the clamp by flexible linkers, which allow the enzymes to position themselves properly for attacking RNA primer threaded through the middle. PDB entry 3u5z includes two copies of the complex of clamp, DNA and clamp loader, one with an open clamp (shown here) and one with a closed clamp. You'll notice that one of the DNA strands is longer--this corresponds to the template strand. The clamp will then assist DNA polymerase in extending the shorter strand. 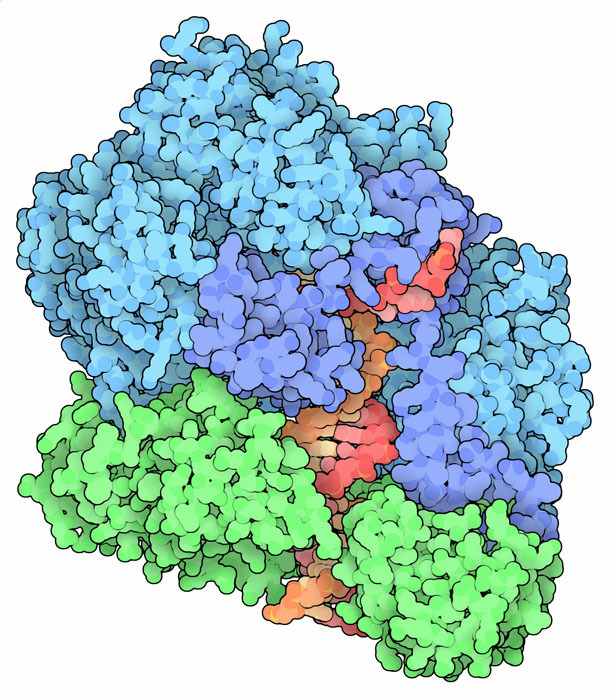 There are also sites for binding ATP between each of the five clamp-loader subunits. 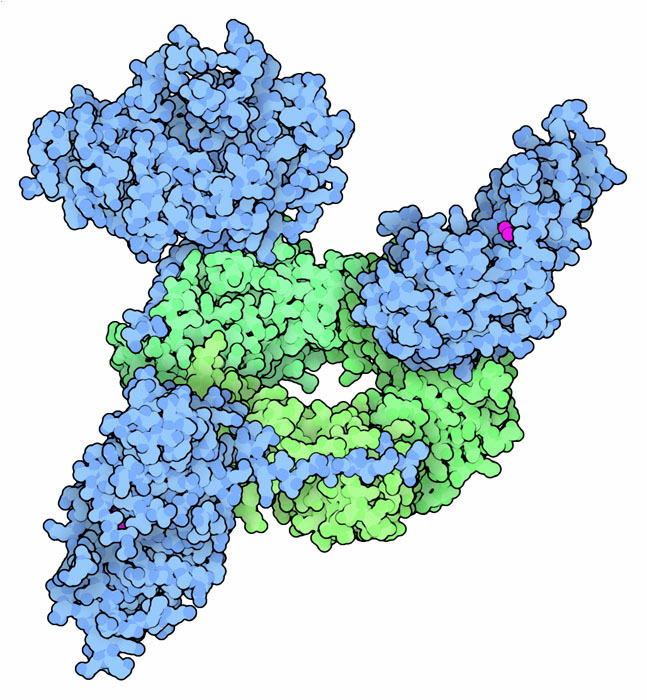 This structure includes molecules similar to ATP that can't be cleaved (shown in magenta). To compare the open and closed forms, click on the image for an interactive Jmol. You can find structures for clamp loaders from other organisms in the PDB. Notice that they all have a similar structure, with five subunits in a helical arrangement. Some organisms use sliding clamps composed of three subunits, and others use sliding clamps with two subunits. You can find structures for both types in the PDB. B. A. Kelch, D. L. Makino, M O'Donnell & J. Kuriyan (2012) Clamp loader ATPases and the evolution of DNA replication machinery. BMC Biology 10:34. T. R. Beattie & S. D. Bell (2011) The role of the DNA sliding clamp in Okazaki fragment maturation in archaea and eukaryotes. Biochemical Society Transactions 39:70-76.